ATLANTIC CITY, N.J. (AP) -- IBF welterweight champion Devon Alexander earned a convincing victory over Lee Purdy at Boardwalk Hall on Saturday night in a non-title bout. Referee David Fields stopped the fight on the advice of Purdy's corner at the end of the seventh round. Alexander (25-1, 14 KOs), from St. Louis, was supposed to be making his first defense of his title, but Purdy (20-4-1, 13 KOs) failed to make the 147-pound weight limit. Purdy first weighed in at 148 pounds Friday at Caesars Atlantic City. Under IBF regulations, Englishman had two hours to take off the extra pound, but still weighed 147.8 when he stepped back on the scale. Purdy, ranked No. 4 by the IBF, accepted the bout on four weeks' notice. He stepped in for No. 1 contender Kell Brook, a fellow Brit who sustained a foot injury while training. With the victory, Alexander put himself in position for a potential fight against another English boxer, former junior-welterweight champion Amir Khan. Alexander would also relish a chance to face Floyd Mayweather Jr., regardless of the weight class. 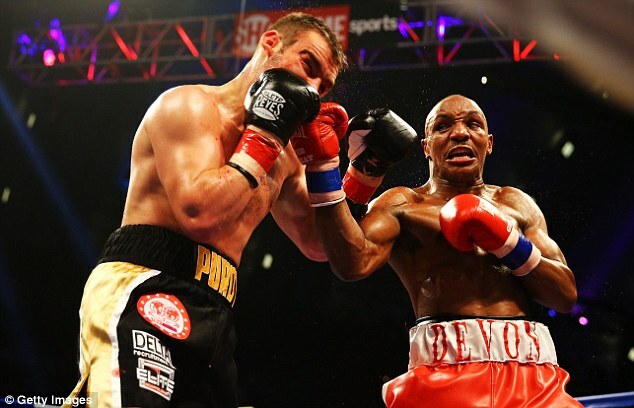 Welterweight titlist Devon Alexander gave his fists a good workout on Lee Purdy's face and body, easily dominating until Purdy's corner called off the fight after the seventh round on Saturday night in the Lamont Peterson-Lucas Matthysse co-feature at Boardwalk Hall. Although Alexander (25-1, 14 KOs) retained his title, the fight lost a measure of its significance at Friday's weigh-in when Purdy (20-4-1, 13 KOs) failed to make the 147lb division limit, weighing 147.8lbs on his final attempt. It was the second consecutive 147lb fight for which Purdy missed weight and he wasn't eligible to win the title. Even if Alexander, who was 146.7lbs had lost, he would have kept the belt. Purdy, 25, also had to give up $15,000 of his $150,000 purse, with $7,500 going to the New Jersey commission and $7,500 being added to Alexander's $700,000 purse. Still, with the victory in hand, it went down as the first defence and fulfilled the mandatory obligation for Alexander, who won the belt in October by decision against Randall Bailey. Alexander, 26, of St Louis, had been scheduled three times to face mandatory challenger Kell Brook, Purdy's British countryman, but the fight was called off three times - once because of an Alexander right biceps injury and twice because Brook was injured, including a month ago when he suffered a stress fracture in his right foot. Purdy, the former British champion, took the fight on a month's notice and was outclassed, although he probably could have had a year's notice and nothing would have changed. Alexander took immediate control of the fight. His speed, technique and punch output were so much greater than that of Purdy, who barely threw any punches. Alexander, a southpaw, stood on the inside and landed lots of clean right hands to the body followed by right uppercuts. Even though Alexander hurt his left hand - he said so in the corner to trainer Kevin Cunningham - and barely used it, he continued to dominate with only his right. "I hurt my left hand in the first round, actually," Alexander said. "I hit him on top of the head and hurt my hand. But I had to get that out of my mind. I had to fight to win. "I wanted to impress tonight. My left hand was on point in camp. When I hurt my right biceps, that strengthened my left. It would have been popping real hard, but I hurt it, so I had to set it up softly." Said Cunningham, "I think he would have had a spectacular knockout if he hadn't hurt his hand." Purdy had taken tremendous punishment, and when he returned to the corner after the seventh, his corner asked referee David Fields to stop the fight. "I knew this was a big opportunity and that the weight would be a big problem, but to have the opportunity to fight a great fighter like Devon, I couldn't turn it down," Purdy said. "I would have stayed in there until my legs wouldn't work anymore. I'm just devastated." Next up for Alexander could be a December 7 defence against former light-welterweight titlist Amir Khan, who was ringside to scout Alexander and to watch his younger brother, Haroon Khan, on the undercard. "If Amir wants it, he can have it," Alexander said. "If Floyd Mayweather Jr wants it, he can have it. I want to fight the best."